All fruit trees require pruning for optimum plant health, growth, and fruit set. Different types of fruit trees require different types of pruning/training. I will try to list all types here. As always, please contact us if you have any questions! 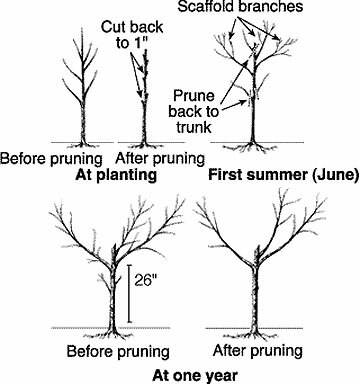 Pruning is the removal of a portion of a tree to correct or maintain tree structure. Training is a relatively new practice in which tree growth is directed into a desired shape and form. Training young fruit trees is essential for proper tree development. 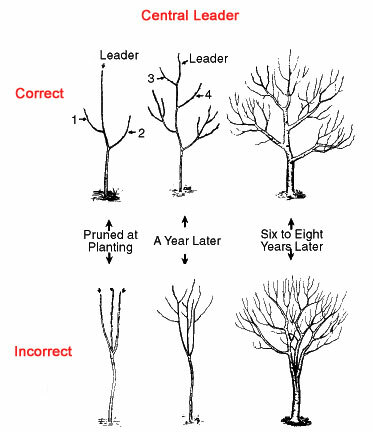 It is better to direct tree growth with training than to correct it with pruning. We strongly recommend pruning in the very early spring, before growth has begun. It is recommend that you start training your new tree once it has been planted. 1) Your goal is to prune for a strong central leader. To do this, remove the tip, leaving at least 4 buds below it. Do this the first year. Leave at least 32″ from the ground to the top of the tree. 2) Starting the second year, in the winter following planting, again trim back the top shoot, but make sure it stays the tallest. 3) Your goal is a pyramid-type shape. Prune to 3 or 4 main branches after you complete step# 2. Select a second set of main branches higher than the first after each subsequent year’s growth. 2) Remove (I know it’s hard to do!) the other later branches, and remove the center main trunk, so that the tree has an “open center” with several strong side branches. 4) Your final product will be a vase-shaped tree. This type of pruning cuts down on disease, and enhances fruit production by restricting space where fruit can grow, thereby giving u you larger, healthier fruit. Make sure to cut back larger trees so that they have an open center. Peaches and nectarines need to be pruned almost every year.